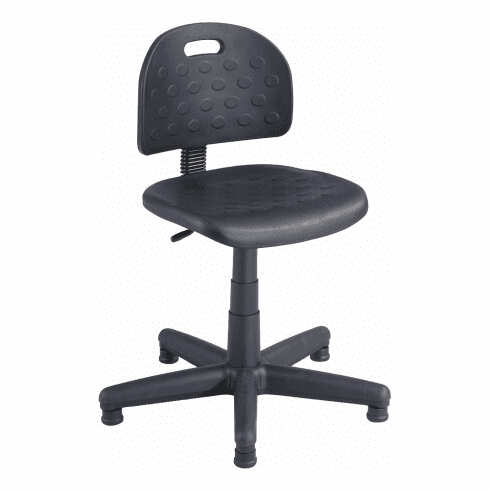 Safco Soft-Tough Polyurethane Task Chair  Free Shipping! If you just need something that works then you're a perfect fit for the Soft Tough™ polyurethane task chair from Safco. Simple economy combines with a sturdy and basic design to create a practical and comfortable desk chair, appropriate for everyday use. Easily adjustable, this chair can be customized to fit your own personal needs, and the solid molded seat and back support you throughout your day. Finished Product Weight: 23 lbs. Overall Height: 28 ½ to 36 ½"
Seat Height: 17" to 22"
This chair normally ships within 2-3 business days from our MN warehouse.